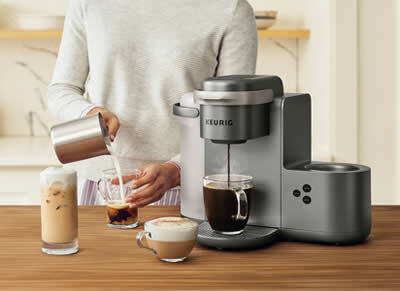 Home » Coffee Makers » Should You Invest in a Keurig Coffee Brewer? Should You Invest in a Keurig Coffee Brewer? The Keurig coffee brewer line is something that you can turn to when you are looking for one of the best single serving coffee maker lines which is currently on the market. A single serving coffee machine is often a tool that many people will turn to when they realize that they have a need for coffee but they do not want to go to the trouble of brewing an entire pot, which they usually can’t drink in the end anyway. To solve this problem, a Keurig coffee brewer could easily make the right amount of coffee for you to enjoy, one cup at a time. A single serving coffee maker, like the one you can find in a Keurig mini coffee brewer, is often a small unit that can easily fit wherever you need it the most. It has a small footprint and will not take up a great deal of room on your counter top. This also makes it a great model to put in the office, in a dorm room, or to take with you on a vacation or business trip. As a compact unit, it can easily fit into your luggage and travel with you wherever you need to go.Even more than this, there are many different beverages that you can enjoy using the specialty coffee pods which Keurig makes. You can also give yourself a mug full of hot water using this unit. By not putting any K-Cups into the machine, you can brew yourself a mug full of hot water that you can use in any way that you see most fit. Basically, using a Keurig coffee brewer can grant you many different opportunities to use a great single serving coffee maker that will fit into nearly any environment. How Do You Choose The Best One? Actually sitting down to select the best models of Keurig coffee brewers can take some work, however. Every person who looks into a Keurig will have a different set of goals for their coffee machine and they will each be trying to fulfill those goals. Determining the best possible model will require you to evaluate your goals before you start making decisions. How much coffee they are going to need at a time. What types of beverages they want to drink. How much space they have available for a single serving coffee machine. How much they are willing to spend on one of these models. Any special features they are looking for with their coffee brewer. Figuring out which model this is going to be for your home can take a bit of work. You will need to look through all of the various models before you find the Keurig coffee brewer which appeals to you the most. Starting this search may require you to look at a few examples of the range that Keurig covers. The following models are intended as examples of what you would be able to find for your home. This is one of the smaller Keurig models which can brew you one cup at a time. Retailing for just under $100, this model can provide you with 2 different cup sizes, depending on the amount of coffee that you want.No matter if you are looking for 8 oz or 10 oz of coffee, the Elite will be able to provide it. Brewing directly into the cup you are going to be drinking from, this machine also cuts back on the amount of maintenance you will need to perform to upkeep the machine itself. The Elite will allow you to remove the water reservoir for the machine to fill it, which can make it easier to get the water you need into the unit. It will also hold 48 oz of water at a time, which means you should not have to fill the unit often. The drip tray for the unit is removable, meaning you can pop it out to rinse it out when you have finished brewing and cleanup is even easier. Finally, with an automatic turn-off feature, you will not have to worry about leaving the unit on and overheating, potentially causing damage! 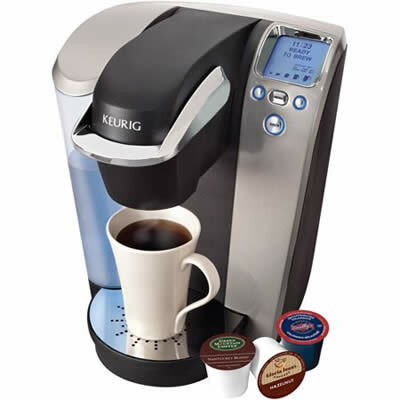 This is one of the most expansive models offered by Keurig, giving you the choice of 4 different brewing sizes.No matter if you are looking for 6, 8, 10, or 12 oz of coffee, you will be able to get it with this model of Keurig coffee brewer. If you put this model into your home, it is going to be easier than ever to brew the coffee that you desire. The water reservoir will hold 64 oz of water at a time, meaning you do not have to often fill it. A stainless steel exterior will make it easy to clean this unit and with dishwasher safe parts, cleaning this unit will not be difficult. The filter system will work with both K-Cups and your own coffee grounds and filters, allowing you to brew whatever you want with this unit. A digital clock is included along with temperature controls, meaning you can make your coffee come out however you desire it whenever you want it. This model does sell for $250, making it one of the more expensive Keurig coffee brewers, but it also offers enough features to make this model truly stand out. If you are considering one of these models, keep in mind how easy it will be to always get exactly what you are looking for.It’s a great option to let yourself enjoy your coffee to the fullest. Why Is Keurig Single Cup Coffee Maker So Popular? After A Cup Of Coffee Copyright © 2019.